"You have this way of making little decisions that somehow affect my entire life." Zelda (Hutchins) is an artist and a single mother who is desperately clinging to her former life as an up and coming artist in New York's bohemian scene. Her child, Little Z, is not a burden; that distinction belongs to her no good boyfriend Max (Fessenden), a poet whose life seems to have no real direction besides alcohol and drugs. Sharing the weight of Zelda's shoulders is her friend Natali (Ramos), a drug addict whose most recent overdose has forced her to move in with Zelda in her already crowded New York loft. 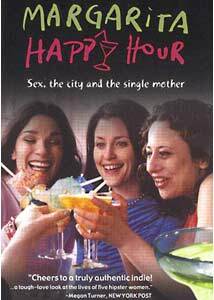 The one spot of hope for Zelda lies in "Happy Hour," a time when fellow single mothers get together to discuss the problems in their lives. Ilya Chaiken's debut film, Margarita Happy Hour, is a gritty, effective look at the life of a woman struggling with the demanding aspects of motherhood. But it is so dark that the film has a sense of dread that takes away from the emotional impact of the script. Drawing from personal experiences, Chaiken has found a nice voice in Zelda, yet too much time is spent on the negative aspects of her life. The presence of a small child offers a showcase for more intimate moments, and we see a time in which Max wasn't as much of a lowlife and why Zelda has stuck with him through the bad. But these moments are short lived, as far too often Chaiken hammers home her point. Chaiken's skill—and saving grace—is in the way that her characters are so expertly drawn; it is a pleasure to watch and listen to them because their personalities are so delightful. In a film where gloom and sorrow hang over the proceedings like a thick fog, it is refreshing that the characters' personalities are truly inviting. Chaiken also effectively eschews the stock elements of an emotional climax and presents the protagonist with an obvious choice, which leads to a satisfying conclusion. So much in Margarita Happy Hour is done so very well that it is disconcerting that the whole of the picture could not have been as perfect its parts. The performances of the three lead actors are elegant in detail and emotion. Hutchins proves a real find in her screen debut, as her performance needs to be the central emotional point of an overly emotional film and she pulls it off regally. Both Fessenden and Ramos offer sufficient support to Hutchins, providing her with the fuel needed for her character's emotional roller coaster. Image Transfer Review: The 1.85:1 anamorphic transfer for Margarita Happy Hour does justice to the locations and feel of the film, as the overly grungy New York settings come off looking just as they do in real life. Colors are muted, yet they are done nicely with no smearing or bleeding. Black levels are perfectly adequate with little grain, while edge enhancement is never a problem. Audio Transfer Review: The Dolby Digital 5.1 mix is typical for that of an independent drama in that it is focused in the center. Dialogue sounds fine, with no distortion or abundant noise. Extras Review: The most prominent extra feature for Margarita Happy Hour is a commentary track by stars Larry Fessenden, Eleanor Hutchins and director Ilya Chaiken. The track is not informative in terms of the filmmaking process, but for those looking for behind-the-scenes stories, you will not be disappointed. The majority of the track focuses on the actors commenting about locations as well as other actors, while Chaiken discusses the hassles of shooting and bit players that pop up from time to time that are acquaintances. A short featurette titled Day 17 is a pointless look at a day on the set via a handheld digital camcorder. The short is devoid of any informative material about the making of the independent film and is rather boring. A theatrical trailer is also available in full frame with Dolby Surround. Margarita Happy Hour deserves credit simply for not falling into clichés or an overly predictable storyline. The performances are first rate and the direction by newcomer Chaiken is meticulous in its construction. Though the overall tone is a bit of a downer, this is a film worth seeking out.